Myeong-dong is one of the most dynamic and exciting areas in Seoul with the floating population estimated to be around 2 million a day. Being mecca of shopping, finance and culture, there are many hotels, cinemas, cafes and of course, great restaurants where you can taste gourmet Korean cuisines at reasonable prices. 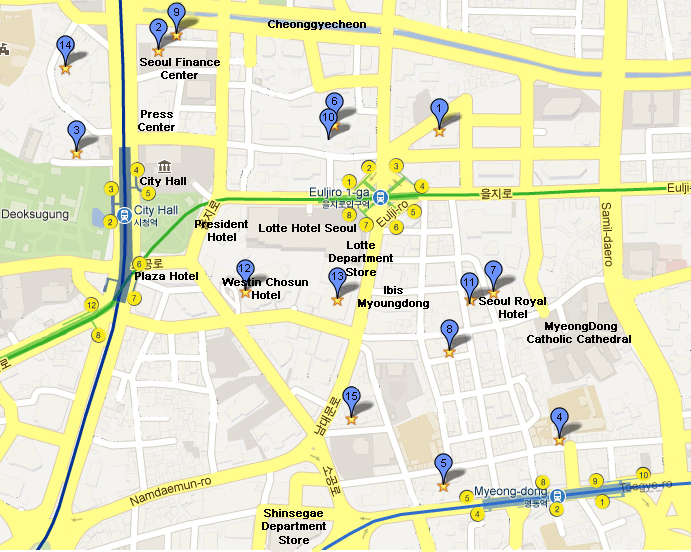 You could also find a lot of international restaurant chains on the main street of Myeong-dong. Founded in 1939, many famous people including former presidents have visited this restaurant. They have a variety of traditional Korean dishes including Korean ribs, BBQ, boiled meat soup(Galbitang) and dumpling soup. Galbitang is their main dish. Crowded in lunch time. Menu: Korean beef of tender short-rib patties, Steamed fresh abalone, Beef cooked in a Dragon firepot. Upscale Korean restaurant with great service and fresh local ingredients. This restaurant holds Zagat ratings as among the most popular restaurants in Seoul. A nice, atmospheric restaurant famous for bibimbap. They also have good side dishes like Tteokbokki (stir-fried rice pasta) and Korean pancakes. Helpful staff. This restaurant and Gogoong h are said to be the two greatest bibimbap restaurants. Helpful staff. Popular among foreigners. Traditional North Korean cuisine. Pyeongyang cold noodles(Naengmyeon) is their main dish. Nice decorations inside. Founded in 1946, this restaurant is considered to be one of the best places for Naengmyeon (Pyeongyang cold noodle). Close to Euljiro4-ga station (line 2 & 5) exit 4. Crowded at lunch time. Opened in 1939, serve Gomtang(beef-broth soup) and Suyuk (Boiled Beef or Pork Slices) only. They give you more soup and rice for free if you ask. Crowded in lunch time. Low price. Serving up delicious pots of Samgyetang (Chicken soup with ginsang) for the past 40 years. Due to the widespread media coverage the restaurant draws many tourists; in fact, about 80% of the restaurant's customers are from Japan! A Korean restaurant known for Samgyetang (Chicken soup with ginseng) made with glutinous rice, gingko nuts, ginseng, garlic and jujube, as well as 30 different types of medicinal herbs and grains. Located near Gyeongbokgung station (line 3). A specialty restaurant with a royal table set in a graceful and elegant atmosphere. The formal meal in brassware and Chinaware tastes very rich, as the natural seasonings are only used for dishes with the whole heart. Various course menus are offered. Famous for various local food restaurants located on it. (Nampo Myeonok is one of the restaurants located on it.) Here are some well-known stores on the street. In this cafe, you can taste Korean green tea, milk tea, and diverse green tea flavored dessert . They use Korean tea leaves grown in Jeju-island only.